The Grand River Dam Authority (GRDA), Northeastern Oklahoma A&M College (NEO A&M) and local agriculture producers have joined forces to form a unique public-private partnership designed to promote agricultural education and place a significant number of agricultural lands back into production following a 10-year lag in harvest. NEO A&M leases approximately 1,600 acres of land located west of Miami along the Neosho River from the GRDA, which is a cost-of-service provider headquartered in Vinita providing customers with low-cost, reliable electric power and serving as a conservation and reclamation district for the waters of the Grand River. Subsequently, that land is subleased to local producers on a cost-share basis where proceeds support scholarships and other funding opportunities for agriculture students attending NEO A&M. “This partnership makes sense because the GRDA and NEO A&M have several common goals, including increasing educational and research opportunities for students, revitalizing agricultural practices in north-eastern Oklahoma and creating a revenue stream for NEO A&M’s agriculture program,” says McKenzie Nygren, agriculture department chair and instructor at NEO A&M. For example, use of these outdoor classrooms has provided students an opportunity to engage in projects that demonstrate the impact of soil moisture, fertilizer and other crop-management practices on subsequent wheat harvests throughout the growing season. From the wheat field to the pecan grove, students are introduced to a wide variety of agricultural practices. 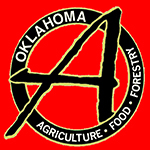 Jim and Holly Hollon, who have grown pecans and managed cattle in the Ottawa County area for several years and own Oklahoma Native Pecan Co., were the first producers to sublease land from NEO A&M, and Holly says they have enjoyed sharing their operation as an educational tool.